Academy conversion and multi-academy trust growth seems to be the future for our educational landscape. Lisa Griffin explores the challenges and priorities this brings for MATs. With the requirement that all schools need to become academies by 2020, or in the process of conversion, multi-academy trusts (MATs) look to be the future of our educational landscape. £140 million has been allocated to convert around 16,000 schools in the next six years, though it seems unlikely this figure will be enough. With a rapid rate of academy conversion set out, capacity at all levels will be an urgent issue. If all schools are to be academies by 2020 we quickly need more expertise in academy finances, more executive headteachers, more business-minded CEOs and CFOs, more strategically-minded governors, well-prepared leaders at all levels able to support struggling academies and more academy sponsors to name a few. How will the education system cope with this? Ahead of our MATs summit and in research undertaken with CEOs, COOs, CFOs, and financial directors among others, these issues and more were discussed. An important theme in research was the differentiation in need and challenge that comes with being a new MAT as opposed to an established MAT. These issues will likely be all the more apparent with rapid academisation. Nicky Morgan has stated that successful schools can become single academy trusts, though smaller schools will need to join a MAT. Will we see a rise in MATs of just two or three schools? Or with up to six schools viewed as ‘starter’ MATs, will we see more large MATs of 15+ schools to achieve real economies of scale? For new MATs, the changes in leadership bring new challenges. Moving from headteacher of a single school to an executive head or CEO of multiple schools requires new skills: how do you align the values, vision and ethos of multiple schools? How do you maintain standards across the schools? Our research found that many heads may not feel ready to take on such a role and that there is limited training available to fully understand what the role entails. Interestingly, the white paper announced that headteachers and MAT CEOs will be among education leaders who will help create a new voluntary National Professional Qualifications for each level of leadership to ‘better prepare’ leaders, though this won’t be mandatory. As a new academy or MAT, where do you begin to set up a new structure? Making the move from one system to another, in terms of governance, leadership, staffing and finances is a huge undertaking. You need a system that maximises efficiency across all of these areas but building such a system, and more importantly ensuring sustainability of it, is a long-term process. For those established MATs planning on growing, building capacity is a challenge. As a MAT leader you need to understand the different issues, priorities and demographics of every school you add. If you are adding a school there needs to be some kind of incentive and clear benefits for that school – you may need to convince a good school, who fear losing their autonomy, to join your MAT rather than set up their own. This is crucial as a successful MAT will need a number of good schools to help achieve school improvement and build capacity. Adding too many challenging schools may drain your resources if you do not have enough capacity and this will impact the reputation of your MAT; you’re judged as one. Getting the balance right between minimising the impact of a failing or challenging school and improving it without harming the rest of your resources and schools is an area of challenge that we consistently found in our research. As the number of MATs and the individual sizes of them increase, a transparent system of accountability is vital. Our research found current confusion around the role of Ofsted and inspections, the DfE and regional school commissioners (RSCs). Ofsted can visit academies in a MAT and write an inspection report on their findings but Ofsted will not provide a grading. Those involved in our research were concerned with ‘how to align practice with expectations from the DfE and scrutiny from Ofsted.’ How will Ofsted evaluate the impact of central teams? How will the impact of a MAT, which consists of both good and failing schools, be judged as a whole? The fact is we just don’t yet know how MATs will be formally inspected and what the judgement measures will be. At the moment there are eight RSCs who are responsible for MATs in an allocated area of the country. They decide if trusts are allowed to take over new schools. In a landscape which will see all schools become academies and, inevitably, a huge number of them form or join MATs, the number of schools RSCs will be responsible for will dramatically rise. Will we see more RSCs? 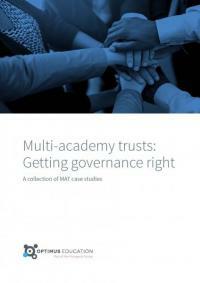 More layers of accountability, with a middle tier between a trust and the RSC? MATs can also be visited by the Education Funding Agency (EFA) who will check the financial accounts of academies annually. With a rapid surge in the number of academies the role of the EFA will drastically increase. There is no evidence so far to suggest that becoming an academy raises standards in a school. Some academies do well, others do badly, just like other types of school. There is no magic wand and with so much recent change in regards to the National Curriculum, it’s hard to keep up in the one school, let alone across a number of schools with different issues and challenges. Indeed if every school is an academy, it’s possible that the National Curriculum could even be redundant. A new league table of performance for MATs is to be created so we will find out how progress and attainment is to be measured and compared across the one MAT and then across multiple. If a MAT-based system is the future, they should be at the cutting edge of education, innovating and leading the way in teaching and learning, research and development, CPD, the curriculum – the list goes on. What accountability measures will be used to judge MATs? Will there be joined up thinking between Ofsted, the DfE and RCSs? What do successful schemes of delegation look like? How do we build capacity in our MAT to ensure sustainability and success?